This view shows you all the jobs that are assigned to you. They are organised in different tabs depending on the status of the Job. The Learn button of the view will give you more details about it. To complete a Job, you just need to click on the "View" button of the Job. You will see all the instructions you need to complete the Job. to mark the Job as done, just click on the square tick box on the side of the title of the Job. If there are any task items, you will need to complete each to mark as completed the Job. To see the description of a task item, click it's "?" icon. Some of the task items may require at least one picture upload to be able to set as completed. This depends on the settings chosen by the Job creator. 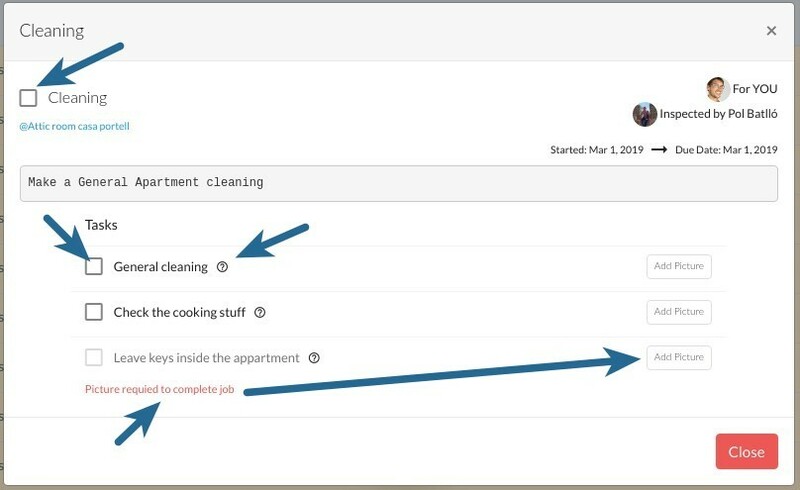 Once you mark a Job as completed, it will be moved to the "Completed" tab. If the job is Inspected by someone, the Inspector will need to Approve it. If it's Declined, the Job will be marked as uncompleted and you will see it again in your current Jobs list.